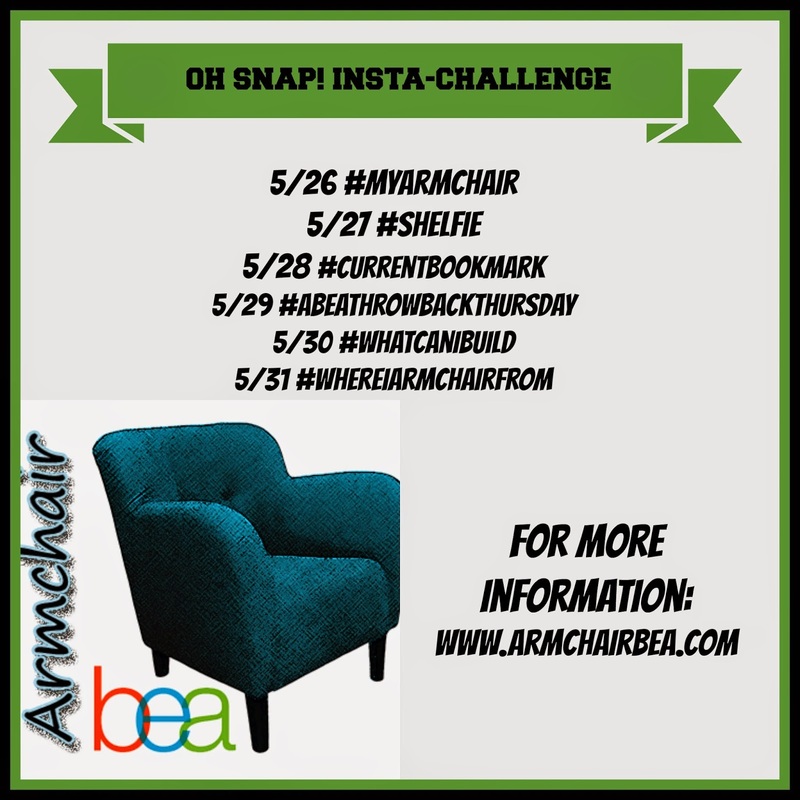 We are so excited to announce our Armchair BEA Instagram Challenge topics for this year, or the “Oh Snap! ArmchairBEA Instagram Challenge” as it is now “officially” known. Tag every challenge photo with both @ArmchairBEA and the daily hashtag (#) *If you don’t tag @ArmchairBEA and use the daily hashtag (#), we won’t know you posted, or for what daily challenge you posted it for. We aren’t going to play guessing games! 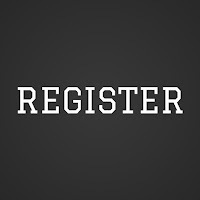 Daily challenge winners will be chosen at 10pm (Eastern) and notified by email. If you are a winner, please follow the steps in your notification email. If you are not a winner, do not despair, just try again the next day! Ok, now the fun stuff! Get your iPhones, Droids, cameras, scanners, tablets and whatever else you might use to take pictures ready! Here are your daily topics, with examples from our lovely Oh Snap! committee members! MONDAY: To kick off the “Oh Snap! Armchair BEA Instagram Challenge”, our first topic is #MyArmchair! Snap a pic of your armchair, bed, couch, hammock, floating pool chair, beanbag or wherever you like to read the most to share with the group! Yes, Amanda's ArmchairBEA space is shared with these two monkeys. TUESDAY: OMG, better take a #Shelfie! Share with us your bookshelves, TBR piles, book stack, etc. Other shelves, drawers and table tops: Amanda's TBR piles. WEDNESDAY: Receipts, grocery lists, report cards, ribbons, gum wrappers, oh my! What is your #CurrentBookmark? THURSDAY: It’s #ABEAThrowBackThursday! Take a picture of your favorite book as a child, or if you are lucky enough to have access to the photo, share a picture of your younger self reading. FRIDAY: It’s time to put those engineering caps on! Hmmmm, #WhatCanIBuild with my books? 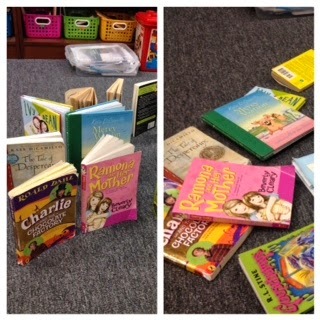 Book dominoes with some of my classroom books! SATURDAY: It’s time to say goodbye to everyone in New York and here at Armchair BEA Headquarters and head home. Show some local pride and share the awesome place you call home. Today’s topic is #WhereIArmchairFrom. Check our Instagram feed often throughout the week as we will be reposting and making collages of our favorite pics and daily winners! I'm in, though the TBT one will be a challenge for me... still I will get it done! fredamans ... Yay!! Get creative with the TBT, and I'm sure it will be great! I am so excited for this, I just hope I remember to go all the days! Yay! So glad to see the list of topics! these creative photos are a personal FAV! can we hashtag our pix as directed, but on twitter to count in for the day's challenge? Faith Hope Cherrytea ... I'm not sure I understand your question. At this time, we are only use Instagram for the challenge, but we still encourage you to post anywhere you would like. Does that help? Faith Hope Cherrytea ... Unfortunately, we are only able to do Instagram at this time because of the logistics of running it. BUT, I will make a note of this to see what we can do for future years.